Tennis elbow, also known as “lateral epicondylitis,” is a painful and functionally-limiting condition affecting many patients. 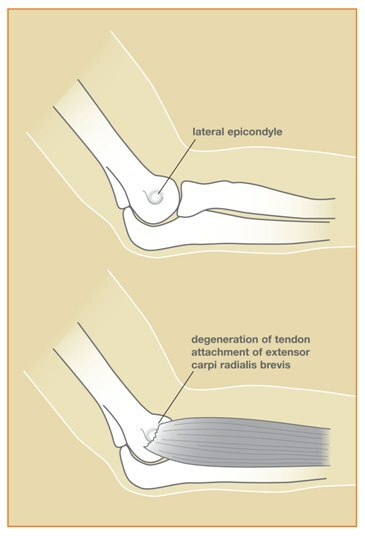 Tennis elbow is caused by degeneration within the extensor carpi radialis brevis (ECRB) tendon on the outside of the elbow. Despite the name, tennis elbow is not just limited to tennis players. In fact, tennis elbow is commonly diagnosed in patients between the ages of 30 and 50, many of whom have never played tennis. Patients experience pain on the outside of the elbow and often point to a very tender spot near the lateral epicondyle bony prominence (see image below). Symptoms can be aggravated by a forceful, repetitive activity with the hand and wrist, such as the tennis backhand swing or heavy gripping. Lifting light objects, gripping the steering wheel, and even simple household activities can be painful at times. Fortunately, the majority of patients with tennis elbow improve with non-operative treatment, although symptoms often take several weeks or months to resolve. Golfer’s elbow, or “medial epicondylitis,” is a similar condition which causes pain on the medial, or inside, of the elbow. Both conditions can be diagnosed in the office based on your symptoms, physical exam, and x-rays. MRI is typically not required to make the diagnosis. What are the non-operative treatment options for tennis elbow? If non-operative treatment fails to improve the symptoms to a satisfactory degree after several months of conservative treatment, surgery may be recommended. During the outpatient surgery, a small portion of degenerative ECRB tissue is removed or “debrided.” This procedure is thought to stimulate healing of the normal surrounding tissues while removing the painful degenerative tissue. The type and length of incision varies among surgeons. This surgery is not a “quick fix” since returning to sports, heavy work, or weight training can take 3-6 months and additional therapy. Most patients experience a significant reduction in pain, report improved function, and are satisfied with their outcome after tennis elbow surgery. However, not all patients experience complete pain relief. No surgery is risk-free. However, major complications from tennis elbow surgery are uncommon. Possible complications include persistent pain, infection, stiffness, and nerve injury. For more information, please contact the Raleigh Hand Center at 919-872-3171 to schedule a consultation with a fellowship-trained hand and upper extremity orthopedic specialist. Physical and occupational therapy is also available at Raleigh Hand Center for treatment of tennis elbow, golfer’s elbow, and other pain-causing problems of the hand, wrist, elbow, and shoulder. RHC serves patients from the greater Raleigh area, the Research Triangle Park, eastern North Carolina, southern Virginia, and South Carolina. If you have a painful elbow or injury please call our office to schedule a consultation. The image and video are provided by the American Society for Surgery of the Hand.